Check the Jam Cam to see if Sunset is affected! The area around S. Centinela Avenue between Ocean Park Boulevard & W. Pico Boulevard 7:15p.m. – 8:15p.m. The area around Sunset Boulevard between S. Sepulveda Boulevard and S. Beverly Glen Boulevard 7:15p.m. – 8:30p.m. The area around St. Pierre Road and St. Cloud Road between Bel Air Road & N. Beverly Glen Boulevard 7:30p.m. – 9:45p.m. The area around Sunset Boulevard between S. Beverly Glen Boulevard & Royce Drive 9:00p.m. – 10:30p.m. The area around Hilgard Avenue between Sunset Boulevard & Weyburn Avenue 9:00p.m. – 10:30p.m. The area around Tiverton Avenue between Le Conte Avenue & Weyburn Avenue 9:00p.m. – 10:30p.m. The area around Hilgard Avenue between Weyburn Avenue & Sunset Boulevard 9:30a.m. – 11:00a.m. The area around Sunset Boulevard between Loring Avenue west to Burlingame Avenue 9:30a.m. – 11:00a.m. The area around Bristol Avenue between Sunset Boulevard & Westboro Street 9:30a.m. – 11:00a.m. The area around N. Cliffwood Avenue between Westboro Street & Highwood Street 10:30a.m. – 12:00p.m. The area around Sunset Boulevard between Bristol Avenue & N. Sepulveda Boulevard 11:30a.m. – 12:30p.m. The area around S. Centinela Avenue between Ocean Park Boulevard & W. Pico Boulevard 11:30a.m. – 12:30p.m. Starting Spring 2017 Sunset Traffic Will Become a Nightmare: Archer School Massive Expansion Approved by Bonin, Caruso Palisades Village, Brentwood School and Mount St. Mary’s Projects all in the Pipeline. You Asked – Sunset Coalition Delivers! 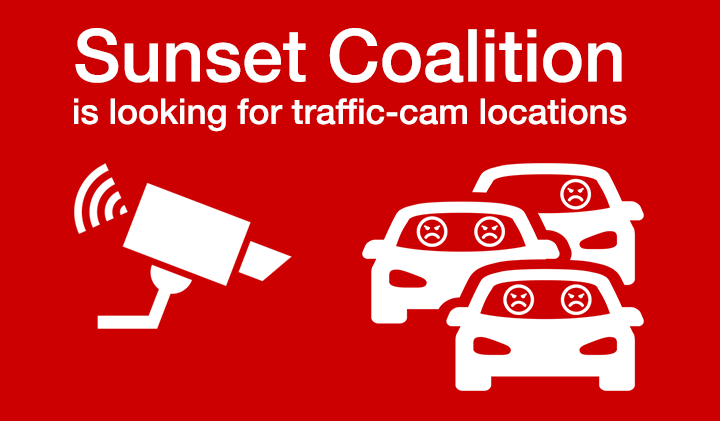 Sunset Coalition announces the Sunset Traffic Jam Cam (the first is located near Sunset/Bundy intersection). Now you can check the Sunset traffic before you start your commute. Visit http://sunsettrafficjamcam.com and check the traffic before you start your drive. We also include Goggle maps with traffic in case you can’t believe the real-time video footage of Sunset Boulevard gridlock. On mobile devices, this site works just like streaming videos on YouTube; you can only view one video at a time, and the video quality might be affected by the bandwidth. We all know how frustrating it is to commute on Sunset Boulevard during peak hours. The intersection of Sunset Boulevard and Barrington Avenue is so gridlocked; Councilman Bonin calls it “one of the worst choke points in the city”. Getting through the Sunset/Barrington intersection is the most crucial part of the Sunset commute. During peak hours, it can take at least an hour to travel the one-mile distance on Sunset Boulevard from Bundy Avenue intersection to I 405! Starting spring 2017, the Sunset traffic nightmare will get even worse. There are several expansion projects starting next year which will have a negative impact on Sunset traffic. Archer’s massive expansion, approved by Mike Bonin, Caruso Palisades Village, Brentwood School (West and East campus) and Mount St. Mary’s projects are in the pipeline. We are fighting to reduce adverse impacts of these and other projects on Sunset Boulevard traffic. The Sunset Traffic Jam Cam site has a feature that lets you tell Councilman Bonin directly what you think about the Sunset traffic nightmare. We have two cameras up so far, and we are looking for more locations, in particular between Bundy/Sunset and Barrington/Sunset intersections, so if you have a good view of the gridlock on Sunset please email: info@sunsetcoalition.org. Archer School for Girls balked at the selection of Judge James Chalfant to oversee the CEQA lawsuit being brought by Brentwood homeowners. 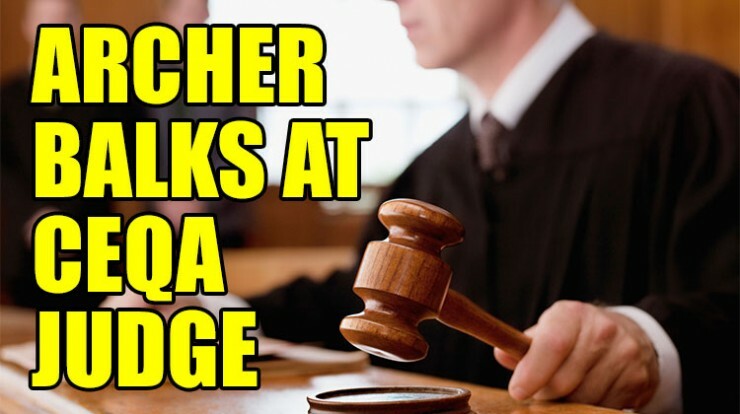 Archer School for Girls does not want to have the pending lawsuit brought in front of Judge James Chalfant, one of the most qualified California Environmental Quality Act (CEQA) jurists on the court. Archer’s attorneys, Latham & Watkins filed a motion to remove Judge Chalfant from the case brought against the school’s massive construction project. Brentwood neighbors announce lawsuit against the City of Los Angeles to block the massive expansion of the Archer School for Girls in Brentwood, California on KABC Channel 7 News. Los Angeles, Wednesday, Oct. 14, 2015 – Brentwood residents today announced they have sued to block the Archer School for Girls’ massive expansion project, alleging it will overwhelm neighborhoods with illegally large structures, jeopardize the health of its own students with toxic fumes and swamp already-paralyzed Westside streets, including Sunset Boulevard, with “tens of thousands” of additional vehicle trips. “The Archer project is a monster – it’s far too impactful and big,” said David Wright, co-chair of the Sunset Coalition, a nonprofit advocacy group and a party to the lawsuit. Wright spoke at a news conference across the street from the school. A digital signboard, set up at the event, flashed messages to motorists stranded in the afternoon traffic jam. The lawsuit is posted on the website sunsetcoalition.org. 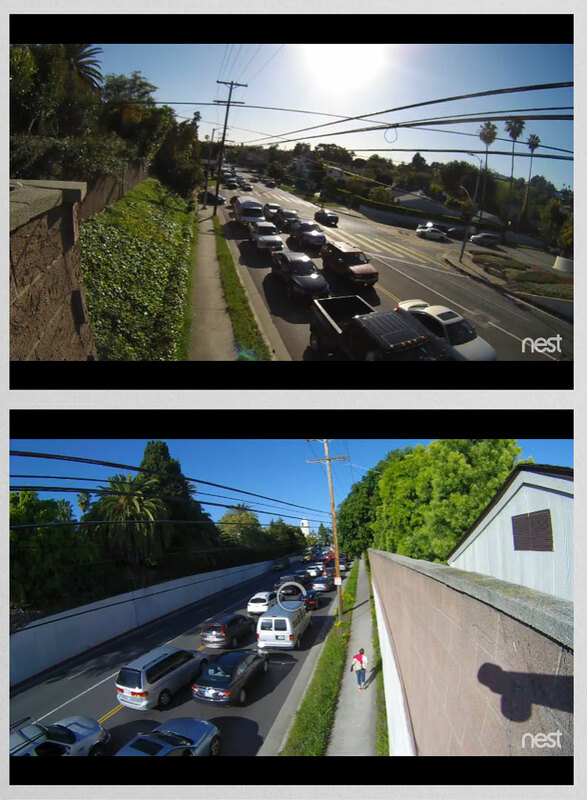 Video shot from a drone of Sunset traffic at rush hour are also available on the website. “Our lawsuit seeks to save the Westside from Archer,” Wright said. More specifically, the lawsuit alleges the Archer EIR failed to adequately analyze the project’s traffic and air quality impacts and failed to adequately mitigate the impacts that were recognized. 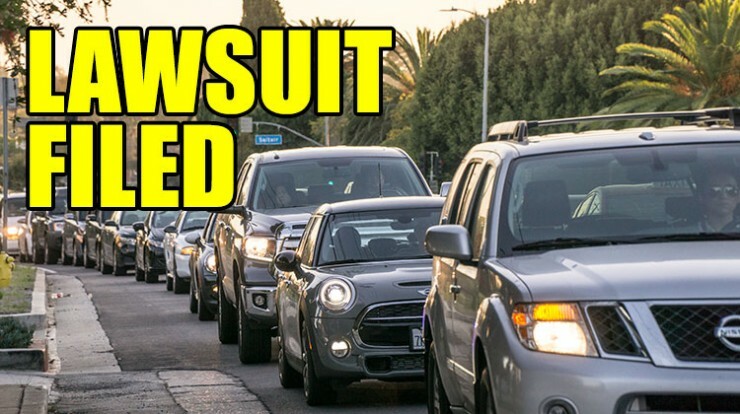 Traffic is so bad now that it can take up to 1.5 hours to travel two miles along the Sunset Boulevard corridor in Brentwood, leaving residents “prisoners in their own community,” the lawsuit alleges. The future traffic impacts of Archer’s enlarged campus (including a new 395-seat performing arts center, two new gyms and a 130 percent increase in on-campus parking) and expanded operations (including a 51 percent increase in the number of athletic and cultural “events” permitted on the campus and a 20 percent increase in enrollment) will only aggravate existing traffic terrible conditions, the lawsuit alleges. “Archer proposes increasing the number of events on campus that will bring tens of thousands of visitors during the course of the 36-week school year for athletic and special events,” the lawsuit alleges. In addition, the city gave Archer permission # for the first time # to run six additional weeks of schooling in the summer. In addition, the lawsuit alleges all the traffic impacts of Archer’s project will be magnified by the school’s decision to intensify its construction program. Originally construction was to last six years. But at the last-minute Archer won City Hall approval to cram all its construction work into three years. But Archer # again in violation of state environmental rules – failed to adequately analyze the serious environmental impacts of a compressed construction schedule, the lawsuit alleges. But “Archer now seeks authority for massive expansions, including taller buildings than allowed by code, more floor area ratio than permitted by code, a dramatic expansion of campus operations” that make it incompatible with the adjoining neighborhood, the lawsuit alleges. Archer’s environmental review illegally failed to identify possible alternative ways of growing the school without concentrating all its growth on its small, 7.2-acre property at 11725 Sunset Blvd. Other schools, like Crossroads, Windward and Marlborough, have only one gym on their campuses (not two like Archer plans to build) and schools, like Brentwood and Harvard-Westlake, have two separate campuses.